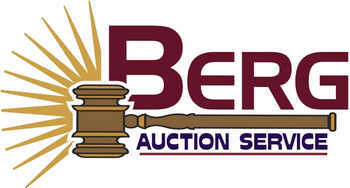 AUCTIONEER AND CLERK: BILL BERG AUCTION SERVICE, P.O. BOX 62, HALSTAD, MN 56548. PHONE 218-766-6797 MN. LIC. NO. 54-12-003, ND LIC. NO. 367. Terms: Cash or your good check, Nothing removed until settled for. Master card and visa accepted when Possible. Very unique marked 3-gal salt glazed Red Wing crock. 5-gal large wing crock. Unique hooded chair (look at pictures online). Crock bowls. Austin powers bobble head. Hall tree. Grandfathers clock. Steel imp seat. Wood croquet set. Other old tables and dressers and lots of items in boxes yet to be unpacked. 2 Bottom IH mounted plow. shop built log splitter. 5th wheel hitch plate for pickup. Cattle gates and cattle stock panels. Some T posts. Upright freezer. Chest freezers. Dining table and chairs. Oak table and chairs. Roller dining chairs. Couches. Stuffed chairs. Recliners. Glass door cabinets. Curio cabinets. Dressers. Beds. Lamps. Roll top desk. Drill press. Scroll saw. Table saw. Disc/belt sander. Bench grinder. Power mitre saw. Laser level. Knipco style heater. Skil saws. Hand tools and lots more. Note: as I write this we still have several loads to pickup so not sure what all is on the sale. There will be like always a lot of stuff. Probably running two rings.